THE B-MOVIE NEWS VAULT: STOCK YOUR VAULT: New DVDs & Blu-rays for 04/10/2018! STOCK YOUR VAULT: New DVDs & Blu-rays for 04/10/2018! Sorry for the delay with this week's edition of Stock Your Vault gang - had to take a few days off to recharge the ole batteries! This week has some fantastic stuff that you'll definitely want to add to your ever-expanding collection Vault Dwellers: Kino Classics brings CONSENTING ADULTS and THE PSYCHOPATH to Blu-ray, Troma debuts REDNECKS and GRINDSPLOITATION TRILOGY in high-def, and Scorpion Releasing gives us RED RINGS OF FEAR. Umbrella Entertainment's long-awaited (region free) trailer compilation, DRIVE-IN DELIRIUM: THE NEW BATCH will be available to U.S. collectors tomorrow (April 13th), and Paramount gives CHEECH & CHONG'S UP IN SMOKE a new 40th Anniversary Blu-ray releases! And while Scream Factory seemingly has all their competitors beat with a trio of new titles (i.e. 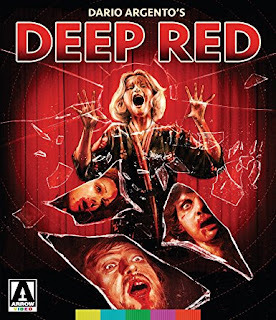 CRUCIBLE OF HORROR, FULL MOON HIGH, and SUPERBEAST), Arrow Video wins the week with their outstanding Limited Edition Blu-ray of Argento's DEEP RED. Boasting 4K restorations of TWO versions of the film, this set is packed with extras, 6 lobby card reproductions, a reversible fold-out poster, reversible cover art, and a limited edition booklet! Though it is a bit expensive (currently $50!) it is totally worth every penny! To see everything else that came out this week on DVD & Blu-ray, scroll down the page!